An excerpt from the diary of an architectural illustrator prior to the crash. It’s 6:30 am and I’ve been up for 3 hours. The newest illustration is nearing completion, but I can’t see it. My eyes have given up long ago and the brush in my hand is moving on it's own. Over the James Lee Burke book on tape I hear the dogs starting to move around and that means that the only one who can tell me if I’m going to crash and burn or pull off another one is getting ready for her day. As she makes her way through the house I ambush my wife in the kitchen by the coffee maker which is still warming the dregs of the last pot I made at five. I must look absolutely crazy. I’ve been in the same pajama pants for three days now and my hair is sticking out at odd angles. The last of a 3 image job sits awaiting her verdict and as Noelle calmly navigates past the dogs awaiting their breakfast, and the husband awaiting her counsel, to the studio, I trail behind her shot through with nervous energy. Something in me relaxes and I start to feel the combined stress of working around the clock, microwave meals, and 300 cigarettes begin to fade. I look at the offending painting and realize that it does look good. My tired eyes can take it in and overall it’s working for me. I sit down with my wife on the back porch and begin to talk about how I’ve got to make a change and how I feel like I need a break or something, but there are more jobs lined up. I’ve got today to get my rest in and I’m back at it tomorrow with a multi-use project for an architect out of Charlottesville. Five images due in just under two weeks. Then the bottom fell out of the economy and I found myself with all the time in the world. Be careful what you wish for or at the very least be prepared. To be honest my work load is definitely cyclical. 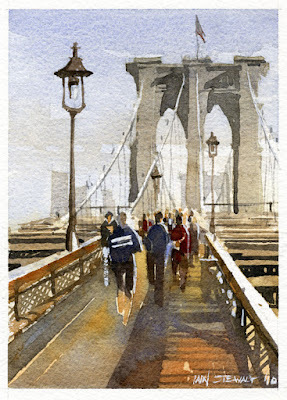 I have been an architectural illustrator in watercolor for the last 14 years. I am used to not having a lot of work on in January, but as February rolled around and the phone still sat silent I began to worry. I had managed to keep myself busy by beginning to work on some images for a father and son show slotted for the end of the year at David Braly’s gallery in Montgomery. I was enjoying myself and beginning to build up a few images that would work for the show, but I certainly wasn’t generating any income. The solution I came up with was fairly simple and probably ill advised unless you are very good at living without a safety net. I would let the work come if it did, but while I had the downtime I had been so desperate for when I was overworked, I would use it to better my painting. Architectural illustration is a precise and formulaic form of creativity and architects are extremely specific about how an image should represent their vision. It doesn’t allow for exploration during the painting process nor does it allow for mistakes. As an illustrator you must supply an image that accurately portrays the design while placing it in a setting that is both inviting and representational of an actual site. While it can be undeniably fulfilling as a means of artistic expression; it is always coupled with the restrictions that creating for a client involves. Many decisions are not mine to make and as I work through the layout of a rendering it is more of a choreography of different ideas than a single artistic vision. As I began to paint for myself in earnest that January in 2009 I found that one of the most difficult things I had to overcome was the complete freedom involved. This may sound ridiculous, but remember I am trained to work as a team member suddenly I found myself playing one on one. My early paintings in 2009 are mostly architectural pieces and are highly technical and detailed, but as I began to understand that I was free to paint anything I started to open up. The realization that I was allowed to make mistakes and actually ruin paintings was incredibly freeing. Not that I set out to do either, but the knowledge that no image should become too precious or self important while it is being worked on allows me to express myself in a more honest way. If I set out to paint a masterpiece I will almost invariably fail in that attempt. However, if I approach a painting with no preconceived notions about its merit I usually end up with something that speaks to me. As for the last year and a half or so it’s been the best, most creative and disciplined time of my life. I’ve painted almost every day and when I haven’t it’s been on my mind. I believe that’s the key. My work is constantly in my thoughts. That, of course, is an incredibly selfish way to live, but in my case at least, the one person who should be angry about that is the most supportive and that’s how wonderful life can be at times. The joy I’ve found in simple observation is perhaps the most surprising aspect of this entire experience. My subjects tend to be mundane and ordinary settings. The sort of thing that a local would walk past every day and not notice. That play between the hidden in plain sight, the natural and man made, in the rural and urban landscape are what intrigue me. I enjoy finding those hidden places that many overlook. I’ve had some successes and a bit of recognition for my work lately, both locally and nationally. These little victories help along the way as I can very easily let negative thoughts bring my goals into question and those goals are fairly simple; continue to paint and push myself in a positive direction, never take anything for granted, and above all don’t let up. As the design industry begins a long climb out of an unbelievably deep hole my phone has begun to ring with more frequency and I have started the juggling game that will be necessary not to find myself burnt out and ready for a recuperative stay in some sort of home. I don’t think it will come to that. The freedom I’ve experienced over the last couple of years is translating into my architectural work as well. The renderings are fresher, more lively, and I get to push them in directions I wasn’t able to before this all started. I will have late nights or early mornings as the case may be, but just as often as not the client will be me. I am the son of Muir Stewart and Fiona Macleod and between them I have been raised the child of a painter, teacher, actress, architect, illustrator, social worker, late in life career changers, and self confessed dreamers. My brother Matt and I were brought from Scotland to Ghana to North Carolina and finally Alabama. I have watched my father paint my entire life and if there’s anything I know about him is that when he is painting at his best all of our lives are better. Encouraging words written by a talented architect, artist, painter... seemingly wise beyond the years. Thank you Iain for sharing your work and your thoughts! Wow...Thank you for such honesty...Now, when I look at your artwork, I will see a little bit of the artist. Happy Holidays! Thanks guys. I had a good time writing this. At first I tried to write about technique etc, but that seemed too stale. I got the first paragraph of this one down and it was a breeze from there. How wise we artists can be, realizing the "down times" are often the very best times for creative growth and exploration that will serve us well ever after! Bravo. Amen, Iain. I''d like to comment further, but I've got a painting to do! So much truth. Great! So honest, so wonderfully written and inspiring. Good work sir. Very nice painting! So striking. Playing nice is a tough one with that. I'm always tempted to grab the squirrel mops and start splashing color on the renderings nowadays. Still-a version of the "playing nice" is starting to emerge. Not necessarily a full blown new style of rendering, but they're getting a bit more painterly and I know that when I'm done I can jump back on something that will allow me my outlet. I too have a foot in each square. At times the dance in interesting, but not boring. I also agree with your comment to never to let up. I view it as two steps forward one back... Support is always appreciated along the way. Iain, that was spot on. Thank you for putting it down in words far more eloquent than I could ever manage. Its hugely reassuring to realise others face the same obstacles and triumphs and I can certainly relate to Thomas's comment about the two not always 'playing nice' as well! Congrats on your inclusion in Pratique Des Arts, your work looks fabulous! (A wave from page 61!) I've not seen this magazine before but the quality really impressed me. Thank you Tracy and Robin. It's a difficult dance in most respects, but I don't think I'd change it either. Tracy- too cool, great image!! Hello, your thoughts are common to the artists. Never sure of the job. Doubt is our engine to continue. Fabulous work and wonderful writing!